This is one of the biggest facts we can gather from the data in this report. With 932,546 people and growing Edmonton’s population has continued to increase for the past ten years. The population has increased by at least 28 percent over this period. This rapid growth has made it one of the fastest growing cities in Canada. The information in this report also reveals that since 2011 Edmonton’s population has grown by 14.8 per cent. Taking a look at the data shows us why this city is considered one of the fastest growing cities in Canada. The city is growing so fast that the Capital Region Board is anticipating that Edmonton will need at least 150,000 new housing units by the year 2040. Also, the CRB estimates that the Capital Region’s population will match the current population of the metro-area of Portland, Vancouver, Denver, Liverpool and Stockholm by the year 2044. How's that for rapid growth. The demographic data from this report also shows that Edmonton currently has one of the youngest populations in Canada. The report shows that 31 per cent of the people in Edmonton are under the age of 25. The average age for the rest of the country is 41 while the median age in Edmonton is 37.7. The data shows that not only is the city growing quickly but the number of young people is as well. The amount of residential and industrial building permits issued total up to 14,328 with more than $8B dedicated to construction. Since 2015 construction has gone up by $4.8 billion and the number of building permits issued has gone down. 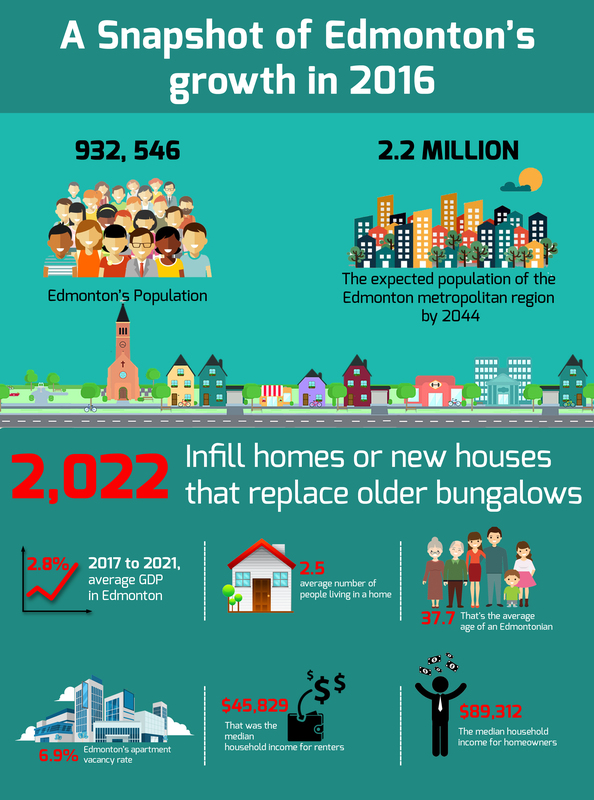 In 2015 1,701 new infill units were built in 2015 while in 2016 Edmonton added 2,022 new infill units. There was a decline in housing starts in 2016 compared to 2015 when housing starts were at its peak. In 2015 housing starts increased to 36 per cent with 13,311 housing starts. Unfortunately, in 2016 it dropped to 7,263 in 2016. The demand for new homes in the city has decreased as different challenges arise in the town like a weaker labor marketing and slower migration. The Economic growth and building permits have all slowed down as a result. At 18.3 per cent building permits were down and at 9.5 per cent construction completions were also down. So after seeing a peak in 2015, there was a significant drop in this in 2016. More than 50 percent of the residential housing consists of single-detached homes. Many of the homes in Edmonton are single-detached homes. A closer look at the report reveals that more people are looking to build multi-family units. Apartments units, on the other hand, experienced the highest growth in the last year. One-to-four story apartments make up about 23 per cent of housing in the city. The data also reveals that many of the homes are in the city are owned by two individuals. At 32.5 per cent the data shows that this is the highest occupancy percentage. Most of the people who live in Edmonton own their own home, and about 27.2 percent of the households in the country consists of one person, while about 16.3 per of the households in the country have three people. After this, about 14.3 percent of the homes consist of four persons and homes occupied by five or more persons coming in with 9.8 percent. The housing market in Edmonton is good which has transformed it into a place with one of the highest rates of home ownership. This higher rate of homeownership is more than the number of renters. The census data in 2011 showed that about 65 percent of people living in Edmonton owned their own homes. This market is one that offers a person lots of opportunities to own their own home. After taking a look at all of the data we see that the trend of growth in Edmonton is healthy and on the rise. More people are moving to the country, and it doesn’t seem to be slowing down anytime soon.